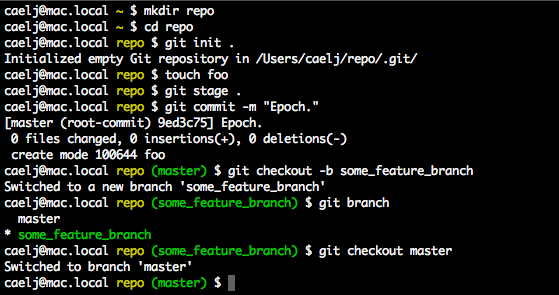 When in a repository directory you can show the name of the currently checked out Git branch in the prompt, making it easier to track where you are (and where you're about to commit). The following instructions are written for Mac OS X (Lion) or later, using a terminal with bash. However, you can use more or less the same approach on Linux, just with a different configuration file. Open the Terminal app and if the file ~/.bash_profile does not already exist create it with the following command. Harry Cutts points out in the comments that you should be able to use the file ~/.bashrc instead to make this method applicable to Linux. Open ~/.bash_profile in your favorite editor and add the following content to the bottom. Depending on configuration changes you may have made previously you may already have a PS1 variable being exported. In this case you will need to add \$(parse_git_branch) somewhere in the existing value. The \[\033[32m\] parts set the color of the branch text. If you prefer another color check online for a reference on valid values. The \ in \$(parse_git_branch) is important to ensure the function is called each time the prompt is displayed; without it, the displayed branch name would not be updated when, for example, checking out a different branch or moving in and out of a Git repository directory. Now when you change to a directory that is within a Git repository, the prompt will be supplemented with the name of the current branch. When you switch branches the prompt will update accordingly. If you are using an existing Terminal session, don't forget to make the changes take effect by sourcing the file with the command source ~/.bash_profile.